Okay who is this? Girl walks up to the MAC counter and only needs a concealer and walk out with a bunch of other stuff she didn’t mean to get? Oh wait that’s me! Happens EVERY SINGLE TIME! I needed a new concealer. Well not needed but wanted a lighter one. My MAC NW25 Pro Longwear is to dark for me in the winter. It is perfect for summer but winter not so much. Since I love how long lasting the MAC Pro Longwear concealers are I had to get another one. This time I got it one shade lighter in NW20. Now that’s a perfect fit for my winter skin. Did you know that the MAC Pro Longwear concealer makes a great eyeshadow base as well? It doesn’t crease so it works great in the lid area. With the little pump top, it can be hard to get just a teeniest amount you only need for under your eyes so I use it on my lids as a primer and now I don’t have extra concealer floating around on the back of my hand. I hate wasting that concealer!! Of course I can’t buy just ‘one’ thing at MAC, especially when I am waiting to be checked out. I drool over all those goodies at the counter. As I was waiting, I started swatching eyeshadows. I knew I wanted a neutral dark matte brown. Even though Brown Down is a Veluxe Pearl, it blends and acts like a matte. Brown Down looks very warm in the pan but swatches very neutral. I think this had been discontinued but my MAC counter still had it so I got it. Not like I really needed another brown neutral but what the hey? Why not? My other splurge was Stars and Rockets. I have always wanted Stars and Rockets but the last time I remembered to inquire about it, they were out of stock. Now it is mine. I love how this shadow can look so different depending on what base you use it one. Love this shadow so much! LOVE! It’s also a Veluxe Pearl. Stars and Rockets is a lavender purple with pink pearl. Depending on what it is applied over, Stars and Rockets can have an almost duochrome effect. Like when applied over a black base the shadow takes on a blue hue. While not strongly pigmented it can be packed on for full effect. 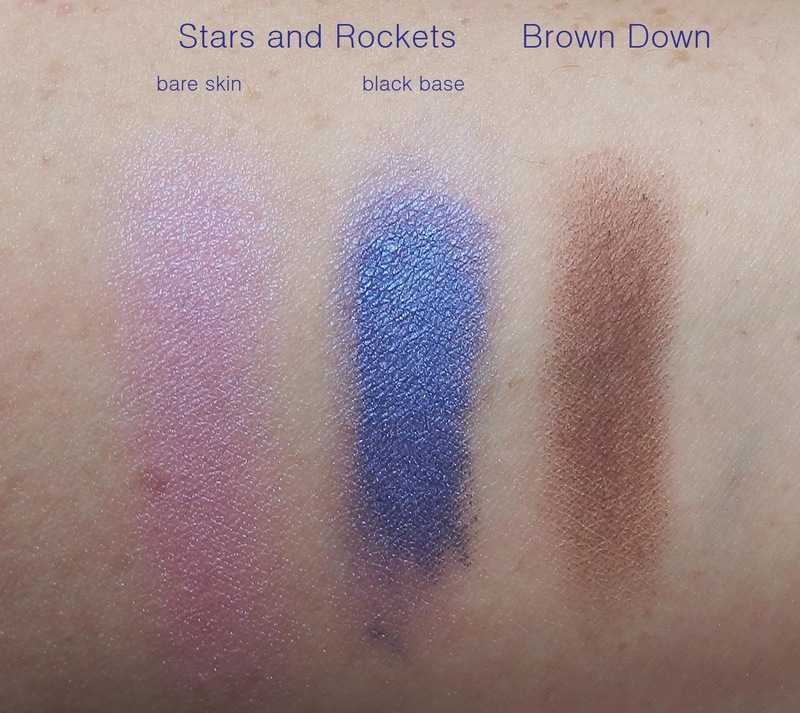 Here is a FOTD using Stars and Rockets on the lid over my Tini Beauty Violette, with Makeup Geek Duchess and Annabelle Purple (#203) in the crease and outer V area. Are you like me? Can’t leave the MAC counter with only one item?